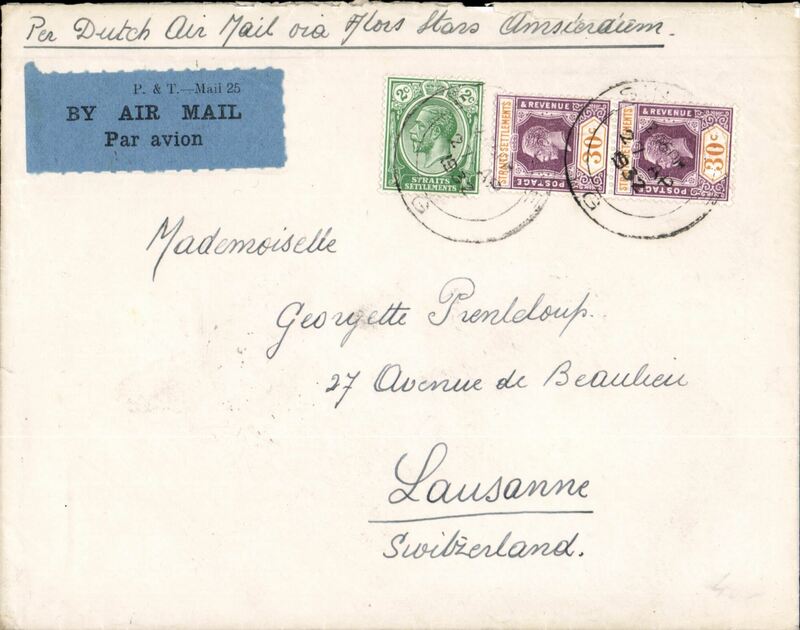 Singapore to Lausanne, Switzerland, via Penang, 28/4, The Europe Hotel/Singapore with lion rampant logo embossed on flap, correctly rated 62c (12c postage+50c air fee), ms 'Per Dutch Air Mail via Alor Star - Amsterdam', local P&T airmail etiquette. By rail to Penang, then KLM to Alor Star and Amsterdam. Nice item. 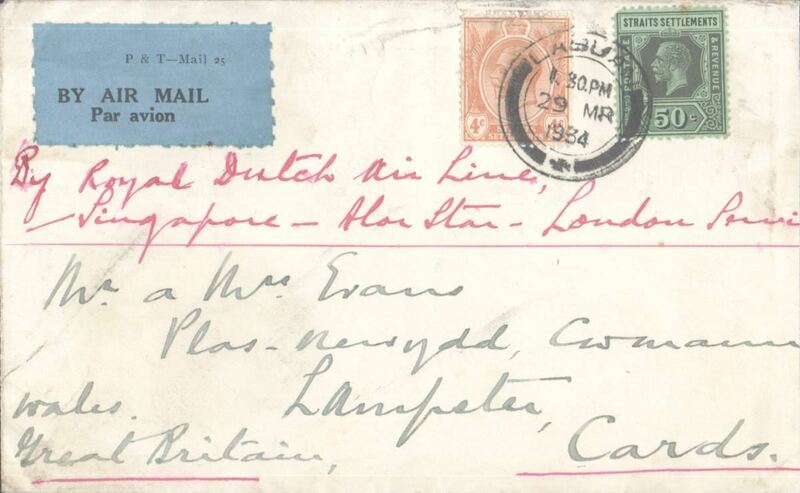 Labuan (British North Borneo) to London, no arrival ds, carried on the Dutch Singapore-Alor Star-London KLM airmail service, plain cover franked Straits Settlements 50c and 4c, canc Labuan' cds, black/blue 'P&T Mail 25 airmail etiquette front and verso, ms 'By Royal Dutch airline/Singapore-Alor Star-London service'. Note: the Imperial Airways service from Singapore began later. 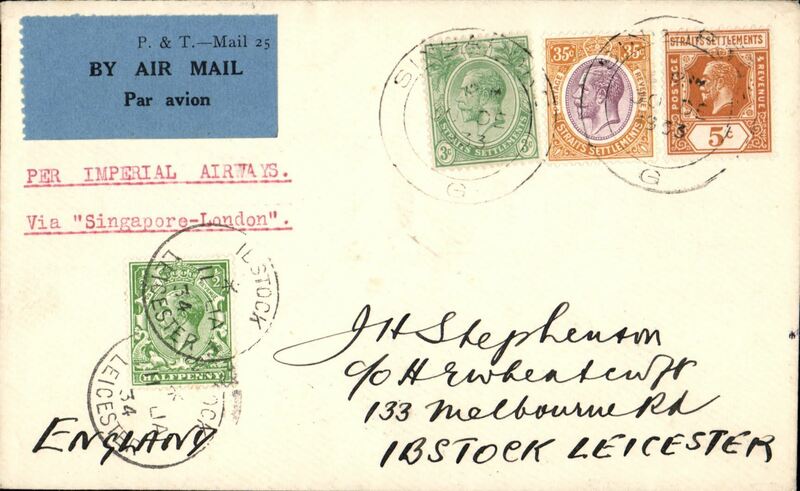 Imperial Airways F/F Singapore to London, 11/4 Ibstock arrival cds on front, plain correctly rated 43c (8c post+ 35c air fee), blue grey/black 'P&T Mail 25' airmail etiquette. 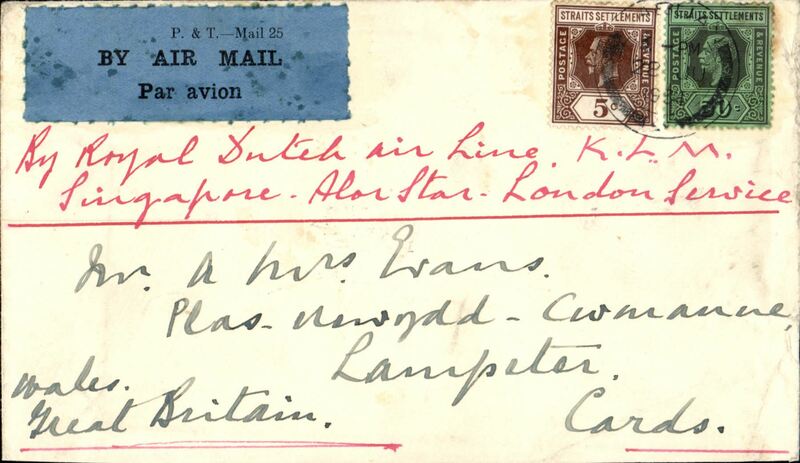 KLM, Straits Settlements to London, no arrival ds, Anglo-Chinese Secondary School corner cover franked Straits Settlements 78c, canc Singapore cds, black/blue 'P&T Mail 25 airmail etiquette. Labuan to London, no arrival ds, KLM airmail carried on the Singapore-Alor Star-London service, plain cover franked Straits Settlements 50c and 5c, canc Labuan' cds, black/blue 'P&T Mail 25 airmail etiquette front and verso, ms 'By Royal Dutch airline/Singapre-Alor Star-London'. 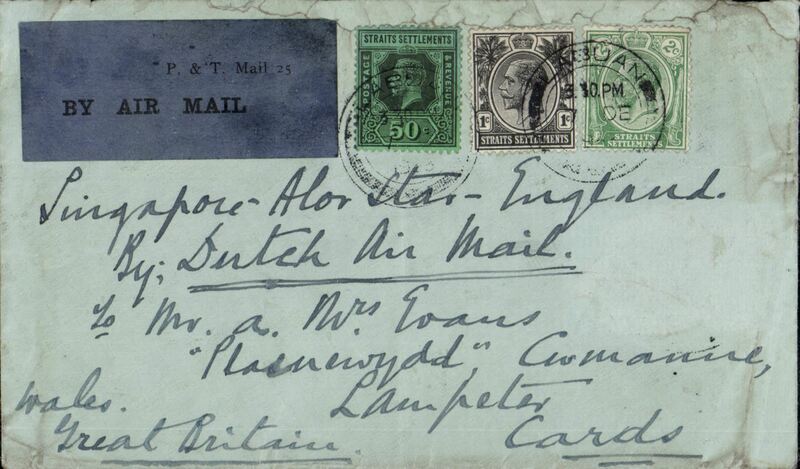 Labuan (British North Borneo) to London, no arrival ds, carried on the Dutch Singapore-Alor Star-London KLM airmail service, plain cover franked Straits Settlements 50c, 1c and 2c, canc Labuan' cds, black/blue 'P&T Mail 25 airmail etiquette front and verso, ms 'Singapore-Alor Star-England/By Dutch Air Mail'. 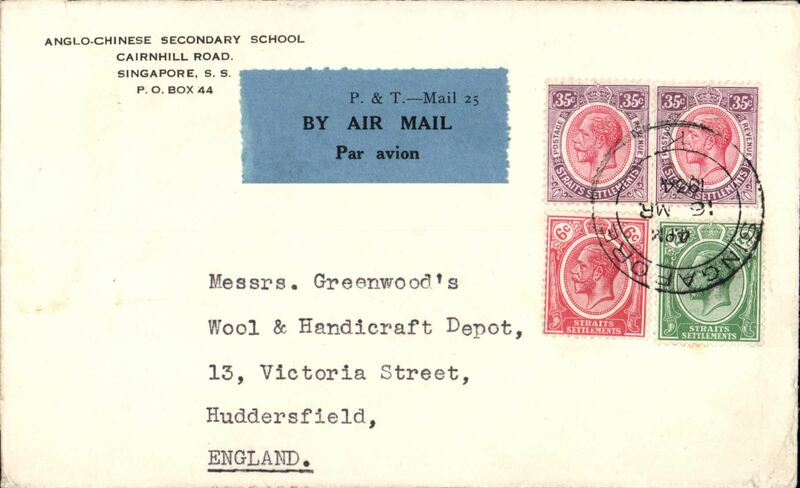 Imperial Airways South Africa Paquebot airmail addressed to England, airmail etiquette cover franked GB 1/2d, 1 1/2d, canc Point Natal/21 Jan 38, no arrval ds, violet oval "Paquuebot/Ocean mail" and boxed "Dunbar Castle/161,420/London/T 5,985 N.H.P. 976" cachets front and verso. Mv Dunbar castle was a passenger Vessel, built 1930, registered Port of London, owned by Union Castle Line, mined and sunk 09/01/19402 miles NE of Goodwin Sands. A nice one for the exhibit!.